A marvel of optical design: the groundbreaking 800mm prime. Introducing one of the most impressive feats of NIKKOR engineering yet—the remarkable full frame AF-S NIKKOR 800mm f/5.6E FL ED VR. Offering sports, news and wildlife photographers the pinnacle of reach and performance, it combines advanced NIKKOR optics and lens technology within a dust- and water-resistant magnesium-alloy body. With Nikon's exclusive Silent Wave Motor (SWM) providing ultra-fast, ultra-quiet autofocusing, lightweight fluorite lens elements improving optical performance and handling, Vibration Reduction enabling faster handheld shooting and an electromagnetic diaphragm for consistent exposures during high-speed bursts, the AF-S NIKKOR 800mm f/5.6E FL ED VR sets a new standard for super-telephoto lenses. And with the included AF-S Teleconverter TC800-1.25E ED, you can increase overall focal length to a whopping 1000mm (1500mm equivalent on DX-format cameras). Conquer distance like never before. As the longest lens in the NIKKOR lineup, the AF-S NIKKOR 800mm f/5.6E FL ED VR delivers an astounding 800mm (1200mm equivalent on DX-format cameras) of super-telephoto reach with a fast f/5.6 maximum aperture in a rugged, well-balanced design. But for even greater reach, the lens includes a matched 1.25x teleconverter (TC 800-1.25E). This high-performance 1.25x teleconverter has an Extra-low Dispersion (ED) glass element for superior sharpness and color correction, and it increases the lens' overall focal length to 1000mm (1500mm equivalent on DX-format cameras). The AF-S NIKKOR 800mm f/5.6E FL ED VR is a marvel of NIKKOR optical design. The lens is comprised of 20 elements split into 13 lens groups. The front and second elements are fluorite (a lightweight mono-crystal optical material), which provides superior optical characteristics and reduced weight for balanced handling. Two Extra-low Dispersion (ED) glass elements provide superior sharpness and color correction by minimizing chromatic aberration, and Nano Crystal Coat (N) reduces ghosting and lens flare throughout the visible spectrum. 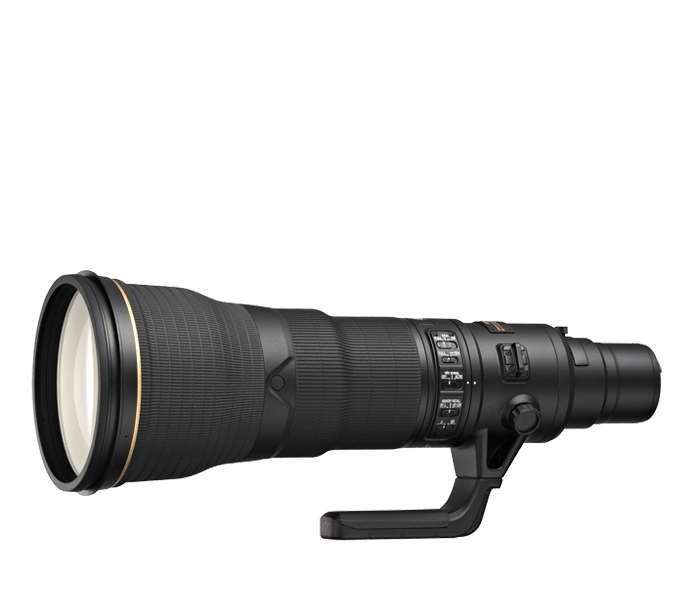 The AF-S NIKKOR 800mm f/5.6E FL ED VR is an advanced lens for advanced D-SLRs. Autofocus is powered by Nikon's exclusive Silent Wave Motor (SWM), which uses ultrasonic vibrations—instead of a gear system—for ultra-fast, ultra-quiet, ultra-precise focusing. It also allows you to seamlessly override the AF system with no time lag. Nikon VR (Vibration Reduction) image stabilization provides 4.5 stops* of blur free handheld shooting, assuring dramatically sharper still images and HD video capture. And for maintaining consistent exposures during high-speed continuous shooting, the lens uses a highly precise 9-blade electromagnetic diaphragm that produces outstanding bokeh under the shallow depth-of-field necessary for separating subjects from the background during peak action photography.